American Prairie Reserve is a remote nature area filled with wonders that are also potential hazards. There is no guarantee of your safety and you are welcome to access APR lands at your own risk. The Reserve is not responsible for any harm done to your vehicle, belongings or person while you are on the Reserve. Prepare for the full range of weather conditions you may encounter during your trip. Read more about what to pack. Please keep in mind the remoteness of the location and lack of cell phone coverage, and be sure to communicate your plans to friends and family before departure. Visitors report some coverage around the Reserve with a very limited number of carriers, including Verizon. Road travel is almost exclusively on gravel and unimproved dirt roads, necessitating high-clearance, 4-wheel drive vehicles and a reliable spare tire. Many roads are unmarked, so use an odometer to track mileage. With even minimal amounts of precipitation, roads can become slick with mud and impassable. The region is known for “gumbo,” a phenomenon that occurs when rain mixes with bentonite clay found in the soil to form a very slippery and sticky driving surface. Please consider the weather forecast in your plans. The Reserve does not have fuel or grocery facilities, emergency care services, or “ranger” type employees. We encourage visitors to plan for supply stops in nearby gateway communities like Lewistown, Zortman, Harlem, Malta and Glasgow. Plan to arrive with a full tank of fuel and enough potable water for your stay. Remember that emergency services could be more than an hour away from your location. Weather in northeastern Montana can fluctuate dramatically from year to year and even from day to day. Learn more about Weather. Do not approach any animal. The Reserve’s bison herd moves freely throughout the Sun Prairie unit, including through the campground on occasion. Please maintain a safe distance of 300 feet as bison can run up to 40 miles per hour. When stressed or threatened, bison display behaviors such as raising their tails, head shaking, and foot stomping. In addition to using caution around bison, be aware of your surrounding and pay attention to the ground to avoid contact with rattlesnakes, the only venomous snake in the region. Ticks and mosquitos are common in spring and early summer – bring repellant and check for ticks after your trip. Black bears have not been spotted on Reserve lands but are known to exist in the Little Rockies around Zortman. The Reserve is an animal-friendly destination in more ways than one. Before packing your pet, be prepared and know the risks, including the potential for encounters with wildlife, ticks, and troublesome plants. 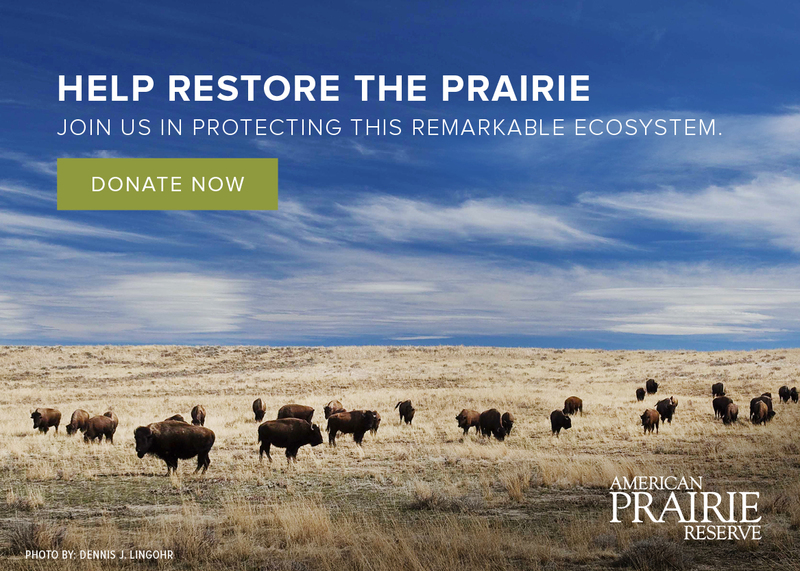 Let's keep the prairie a safe and enjoyable place for all walks of life! For more information, visit Leave No Trace for Pets and review this Dog Hiking Checklist. Dry conditions, strong winds, and low humidity create potential for grass fires, regardless of season. Wildfires can start from a campfire outside of a designated fire ring, not properly extinguishing a cigarette, and even a vehicle undercarriage. Lightning strikes are another common source of fire. American Prairie Reserve has invested in the quality of its risk management practices through a risk management review conducted by the National Outdoor Leadership School (NOLS), an organization with over 50 years of experience managing risk in wilderness environments. As a result of this training, while NOLS doesn’t endorse or certify our practices, the Reserve is further enhancing its risk management strategy. We have invested time and resources in these practices because the health and well-being of our visitors and program participants is one of our highest priorities.